↑ "World Population Prospects: The 2017 Revision". ESA.UN.org (custom data acquired via website). United Nations Department of Economic and Social Affairs, Population Division. पहुँचतिथी 10 September 2017. ↑ ASEAN Community in Figures (ACIF) 2013 (PDF) (6th संपा.). 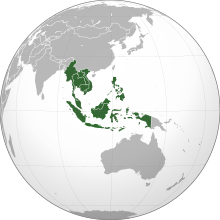 Jakarta: ASEAN. Feb 2014. प. 1. ISBN 978-602-7643-73-4. ओरिजनल (PDF) से 4 September 2015 के पुरालेखित. पहुँचतिथी 9 May 2015.